Obverse Effigy of Queen Elizabeth II and the words "Elizabeth II 10 Pounds 2019"
Effigy of Queen Elizabeth II and the words "Elizabeth II 10 Pounds 2019"
1/10 oz 2019 Britannia Platinum Coin Order your 1/10 oz 2019 Britannia platinum coin from our online store today to enjoy the internet’s best price! This showstopper is the second release of the classic Britannia coin in dazzling .9995 platinum. 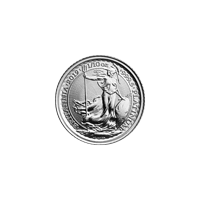 The coin’s reverse features the well-known, atmospheric, artist’s rendering of beautiful Lady Britannia with her trident, shield and olive branch in hand, poised against the oncoming wind; the Lady is set against a light refracting field of micro-engraved, starburst design, akin to the halo of a rising sun. Also on the reverse, a decorative border bearing details of name, year of issue, metal weight, content and metal purity. The coin’s obverse features a meticulously realised effigy of Elizabeth II, shown wearing her elaborate, State Diadem and elegant teardrop earrings; she is set against a light refracting field of micro-engraved texturing. Within the obverse’s light, decorative frame is Elizabeth II’s regal title, as well as the coin’s denominational value. Britannia has been used in artworks and on coinage as a personification of Britain and a symbol of integrity and power for the British people since the 2nd century AD. Celebrate the spirit of Britain and enrich your holdings with a 1/10 oz 2019 Britannia platinum coin today!